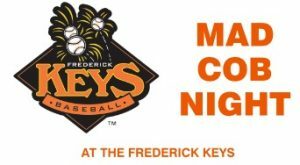 Several of us are planning to attend the MAD COB night at the Frederick Keys baseball game on Saturday, August 11 at 6 pm. Tickets include reserved seats with others from around the district behind home plate, a 2-hour buffet (from 5-7 pm) and FIREWORKS! Use the link to the form to order your tickets today, and talk to Eric Finet or Pastor Angela about ride-sharing. This promises to be a fun evening and a great opportunity to get to know others in the wider district.